Functions from Application Framework Modeling (AFM). Attribute views and calculation views, and so on. You should keep in mind that all created objects should be transportable into further systems. In the following blogs I will explain the process and dependencies in detail. It is rather difficult to come across the same database data models in different systems. Usually we need to combine data from one data model to another and only after that put it into a target table. First of all, in order to have all the objects in one place we should create a package. Next step is a HDB schema creation. In this case we just need to create and save a file with corresponding extension: .hdbschema. As I already mentioned in my previous blog the direction of data replication is not so common and we are going to move data from S/4 HANA to ORACLE. We already created a remote source and virtual table as a target of a data flow. In the second .hdbview we will use WHERE clause to restrict selected data. 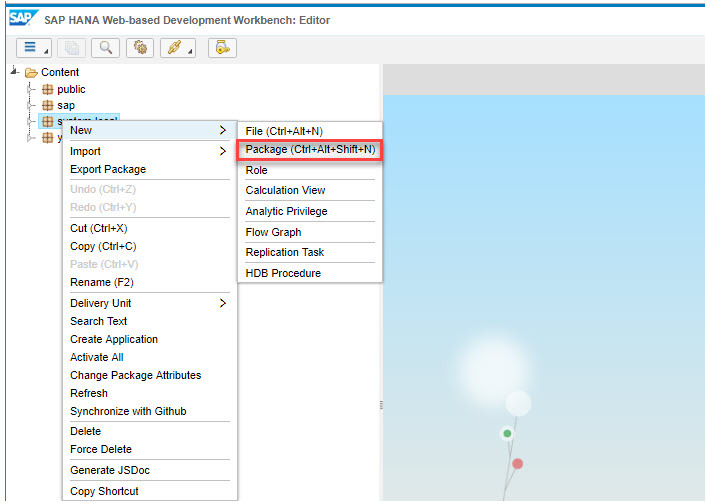 Note: In order to enable realtime replication we would have to create a Virtual Table on top of HANA SDI adapter. The virtual tables would point to the tables mentioned above. Field split and filtering would be incorporated into the flowgraph itself with the use of tools made available in the flowgraph toolset. Now we have two data sets from different table synonyms. In the third view we will join them to have a final dataset for replication. At this point source of data is ready. In order to check the data we have at the source side, just go to IDE-Catalog and select Open Content on each object you have created. In case you have any questions about SDI please feel free to comment under the blog.